Brooklyn hosted many special activities over the Memorial Day weekend, including parade, yesterday in Gravesend and Park Slope. 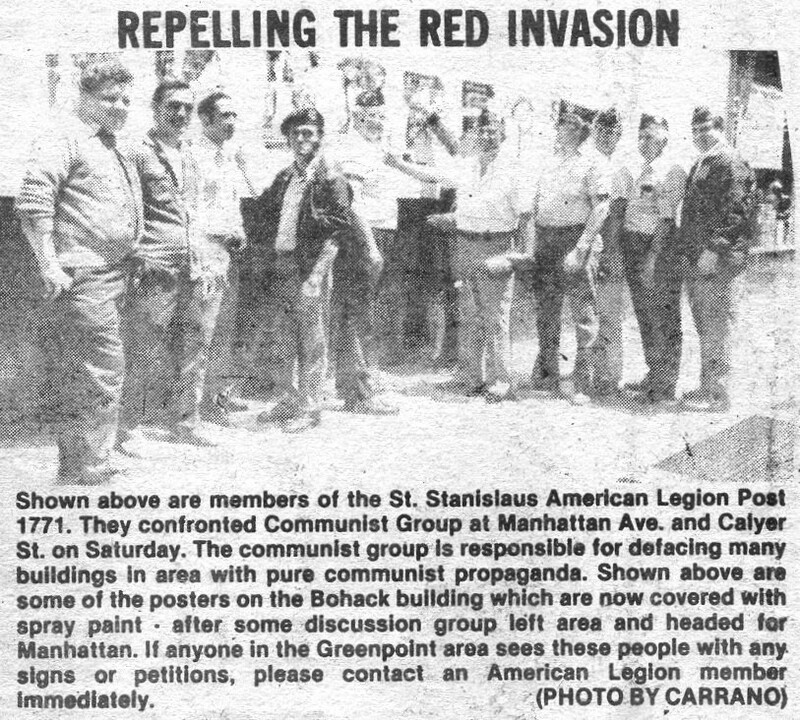 Other weekend activities including the establishing of a home for a freedom torch in Fort Greene and flag-flying in Greenpoint. In Gravesend, the parade made its festive way along Avenue U from Coney Island Aves. The Park Slope parade, along Prospect Park West from 15th St. to Grand Army Plaza, was starred a 94-year-old Spanish War veteran, Richard W. Konter. The parade was organized by the Jewish War Veterans of the Kings County posts and auxiliaries. The Drum and Bugle Corps of the U.S. Marine Corps came from Albany, Ga., to be a part of the march. Also over the weekend, members of the Humboldt St. Block Association in Greenpoint set up American flags along the curb outside their homes and said they would continue displaying them daily instead of just on special occasions. And in Fort Greene, a torch Symbolizing freedom was given a permanent home in the St. Michael-St. Edward Church. The torch symbolizes the close friendship and historical ties “between the U.S. and the residents of Maastrecht, a small town in the Netherlands that was liberated by the 30th Infantry Division in World War II. St. Stanislaus American Legion Post recently had its annual essay contest. There were 5 schools in the community taking part. The winners were St. Cyril & Methodius – Anita Kobylinska Topic Edward W. White. St. Cecilias – Laurie Caracciolo – Topic Martin Luther King. St. Stanislaus Kostka – Mary JankoWska – topic Casimir Pulaski. St. ‘Anthony – St. Alphonsus Joseph Cobb – Topic Wright Bros. Junior H.S. 126 – Sonia Perez Topic Sarah Hale. These young people put their hearts and minds into this project and are a great credit and asset to their community and schools. A special thanks to Nick Stefanizzi Jr. V.C. Chairman and Ed Strack Co-Chairman. Each winner received an American Legion medal and a U.S. Savings Bond. All were treated at St. Stanislaus post. A first for Greenpoint occurred through the Humboldt St. North. Block Association headed by President Nick Stefanizzi. Many American flags were purchased and put into permanent fixtures on the sidewalks. To help celebrate this patriotic event the St. Stanislaus American Legion Post of McGuinness Blvd. sent its color and honor guards. To all those involved, the block association, the people who purchased flags and the American Legion members who participated we say well done. This might inspire other blocks in Greenpoint to pick up the flag on this project. The judging will be conduct under the supervision of William Cornand, dog trainer a handler and employee of the Green Point Savings Bank. This event will be held Saturday, June 4th, 12:00 Noon at St. Stanislaus Memorial Post, 100 McGuiness Blvd., weather permitting or the Rain-Date be Sun., June 5th at the same time. Since this is the first event this kind, in Greenpoint, we a depending on you for support that this can be an annual event. Time is running out! Don’t be one of the sorry dog owners who forgot to enter our show. For applications and information please call 383-0775 between 7 – 9 PM or stop by St. Stanislaus Memorial post on, Weds., Thur: or Fri. night (6-9 PM), where GVFA rep will help you to enter the spot. Spectators will be admitted free. (Bring your own chair, but no lounges please.) The day will be full of fun for young and alike. Refreshments will be available plus other attractions such “Spin Art”,’ Raffles, etc. Of course we will have representatives available to answer all your questions concerning our group and our low-cost-spaying a neutering program. Please don’t miss this important first time event and on again don’t hesitate to enter your dog as you may have an “Award Winner” right at your feet as you read this article. Rev. Father Szpilski, Honored Legion guests, Hon., Senator Tom Bartosiewicz. Hon. Assemblyman Joe Lentol my comrades and ladies & gentlemen. I am deeply honored tonight not for myself but that I have had the great honor of being a Commander of Stans Post, Much has been said tonight as is said at all testimonials. A lot of talk always sounds better than the actual deeds. But, as legionnaires who have served their country in time of need we all know that a General without an army could never win a war. So it is with a commander of any Legion Post. He is only what his membership makes him. St. Stans is one of the great Posts in the great American Legion. To attain that plateau the membership made itpossib1e. St. Stans Post has been around over 25 years and wil be here for many more years. The future of our post is bright. So if I may just let me say to all of you wonderful people and the new leaders of the American Legion and my Commander John Montagano, May God continue to bless each & everyone of you in all your future endeavors. I want to take this opportunity to extend my thanks to our great color guard, the best in Kings County my executive committee which happened to include Josephine Kowalski the first woman officer of our post. And lots of thanks to John Montagano, Al Kowalski, Sonny Crescente, Richard Fitzgerald, Harry Schwartz, Al Mann, Nick Steffanizzi Jr. and Chairman. Nick Stefanizzi Sr. Please carry on for God & Country. On Friday, Sept. 30, 77, the St. . Stanislaus Memorial Post #1771 held their annual installation of officers in the Post Lounge at 100 McGuinness Blvd. An overflow crowd of Post members and their families enjoyed the first social event of the Post season. Many “old timers”, and the newly elected officers were joined by Councilman Abe Gerges and Senator Tom Bartosiewicz who dropped in to say hello. The officers were installed by County Commander Leonard Parisi and Past County Commander Vic Allegretti. Newly elected Commander Nick Stefanizzi Jr. spoke to the crowd of “getting involved in their Post”. He kicked off a promised, aggressive membership drive, headed by Vice Commander Al Kowalski and Americanism program under Vice Commander Ed Strack. Nick also spoke on a petition drive to be undertaken in the community St. Stan’s to reinstate the House Internal Security Committee, formerly the House Un-American Activities Committee. He stressed how our neighborhood especially, should realize the importance this committee considering our problems on Manhattan Ave. last year with Communist groups attempting to intimidate and deceive our neighbors. As the commander of the St. Stanislaus Post, I of course was greatly disturbed by the letter I read from Mr. Krygowski in last week’s paper. I immediately set out to find out what had occurred that particular day on the avenue. To my dismay I fund there was some truth to what Mr. Krygowski charged. As I thought about our members. community residents giving their time for our membership drive and collecting some petitions for one of our Americanism programs, I realized their intentions were never malicious. But whether this happened from a lack of understanding, and unprepared of what he was doing, confusion with some of our other drives, or a hasty misguided competitive decision, attempting to explain it away would be meaningless. Since some people were obviously misled, I have on this day turned over all petitions collected on the day in question to the editors of the Gazette. Since this drive was undertaken in the best interest of our community and country, I feel we can best show our good faith by giving up all petitions collected on this occasion to avoid any signatures that were collected under false pretenses, to be used. After getting this far, I sat back, took a deep breath, and became very angry. I slowly reread Mr. Krygowski’s generalizations about not trusting anyone ESPECIALLY the American Legion and the inference that very few people would have signed this petition if they knew what it represented, is an outrage. Why not an attempt to correct this isolated incident instead of seizing this opportunity to attack the American Legion, as a whole: When you are attempting to accomplish things with volunteer work the operation is not always smooth and precision like, but at St. Stan’s the mistakes are always corrected and or eradicated before the end results are in. As far as this particular issue goes, let’s set the record straight. It is an attempt to have House Resolution #48, introduced by Rep. Larry McDonald voted into law. This resolution would reinstate the Internal Security Committee of the House of Representatives that grew out of the House Un-American Activities Committee. It was abolished in 1975 under conditions, which were to say the least irregular. Arid how about all that “wonderful” literature that’s becoming more and more prominent on our street corners, and those strange faces behind those extended hands. I say, why the sudden interest in our community. Yes I’m worried–hundreds of thousands of dollars in federal monies flow into the neighborhood, and qualified community residents remain unemployed while we “import” specialists to fill so many positions. Yes I’m worried–and just the fact that I could have these questions, these reservations is reason enough for me to have this committee of watchdogs returned to existence. I want to feel that I have these guardian angels in congress to question when I have doubts about the way things are going. And I want to know why my representatives in Congress aren’t asking me how I feel about this resolution they have before them. For two consecutive Saturdays, groups of young people were petitioning passersby for their signatures, in front of the Greenpoint. Savings Bank. Petition no one was able to see and read. Orally people were told it’s to better their future. Some of the people who signed could not read in English. As of now, no one seems to know what the petition is for. They invade our community, in the middle of the night, slapping propaganda on the walls private and government (mail boxes) property. What had they to fear Arrest? For defacing property? Or was it the fact that their literature was spitting venom against our country. The venom, which has poisoned their minds, without having ALL the facts. Don’t let them poison your minds and the minds of your children. Hear both sides of the issue. Just the way you should do, when you are selecting the best man to represent you in the Assembly, State Senate, in Congress and the U.S. Senate. These people who were on the avenue petitioning you and you knew not what for, are the same people who intend to disrupt the 200th Anniversary celebration of our great country, in Philadelphia, this coming Fourth of July. What are they doing, at this moment, would they be able to do the same in a communist occupied country? Don’t look for your enemy beyond the blue horizon. He is here amongst you recruited by Moscow. The modem Trojan Horse. They will curtail your freedom to a slave existence. To a one party vote. Your rights as free citizens, to speak out on issues, would be nil. They are waiting, very patiently, for the “backbone of the country to disintegrate. The American Legion. They hate the American Legion because the Legion can see right through their scheming ways. As long as the American Legion is in existence, it will be your eyes and ears to forewarn you of any dangers, to your freedom. Fight for your rights peacefully. Most important, be aware of what’s going on around you. They will be back. They don’t give up that easily. This time be prepared. Those of you who know be there to tell them, the way you did last Saturday, what its like to live under communist rule. What it’s like to live in a concentration camp. One of the organizations listed is the Vietnam Vets against the war. What war? Unless. I read the wrong papers or watch the wrong news programs; I was under the presumption the Vietnam war was over. How long would you last behind the Iron Curtain preaching revolution? When they come back, let them know your exact feelings. Under our way of life they have the same freedoms, each American has; Do it peaceful but to it, “For God and Country”. Note: For more on these on what the Vietnam Veterans Against The War are all about CLICK HERE. You will be surprised! 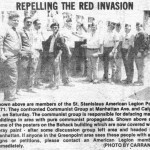 The 10th anniversary of the Greenpoint Flag was celebrated with a rededication in McCarren Park at the original site of the first raising of the Greenpoint flag by Mayor John Lindsay on June 7th, 1967. At that time the Greenpoint Civic Council had sponsored a contest for the school children to submit designs for consideration by the panel of judges. The winning design was by Ann Kandratino of Green St. who was 18 at the time. Her design also won in the popular community vote to become the standard design for Greenpoint’s flag. The design features a shield showing the Monitor, a bridge, homes and factories. The colors on the flag are green, white & gold. The flag was provided Greenpointers with opportunity to demonstrate community spirit, which benefits the total community. Greenpoint is the first community in the United States to have its own flag and at this time there may be other communities in America that might also now have a flag of their own. At the ceremonies marking the rededication of the historic event were: State Senator Tom Bartosiewicz, Councilman Abe Gerges and Borough President Howard Golden who arrived at the ceremony after the photos were taken. Also lending some color to the event was the St. Stan’s Color Guard. At the time of the first raising of the flag we were swamped with coverage by the press and T. V media and due to the start of the Israeli War on that date we did not receive all the T.V. coverage. The original idea for the flag came from Ralph Carrano who presented it the Greenpoint Civic Council and they in turn sponsored the contest for the school children. The president of the council at the time was Ray Mizgalski. St. Stanislaus Memorial Post, at its March 2nd meeting, endorsed Nicholas P. Stefanizzi for Vice V Commander of Kings County, American Legion. A charter member and awarded I a “Gold Card” for Life Membership, Nick Stefamzzl has been active in both, the Post and County levels. He was the third Commander of St. Stan’s Post, serving from 1952 to 1954. Once again, twenty-one years later, he ran again for Post Commander being elected without opposition for both his terms, from 1973 to 1975. As a delegate from the Post to the County, Nick was nominated and elected to the position of County Executive Committeeman. During his tenure he chaired two “County Band Dances” and a third he’s chairing I which will take place at St. Stan’s Post this coming April 23rd. He was very successful as overall Chairman of the County Ball, last year.